Called “the flower of May”, this little, sweet smelling flower is the birth flower for the month. A woodland plant native to the Northern Hemisphere, the lily of the valley sends up its lovely little sprays of bell-like white or pale pink flowers each spring. The plain, oval blades, with somewhat concave surfaces, are deeply ribbed and slant a little backwards, thus catching the rain and conducting it by means of the curling-in base of the leaf, as though in a spout, straight down the foot-stalk to the root. 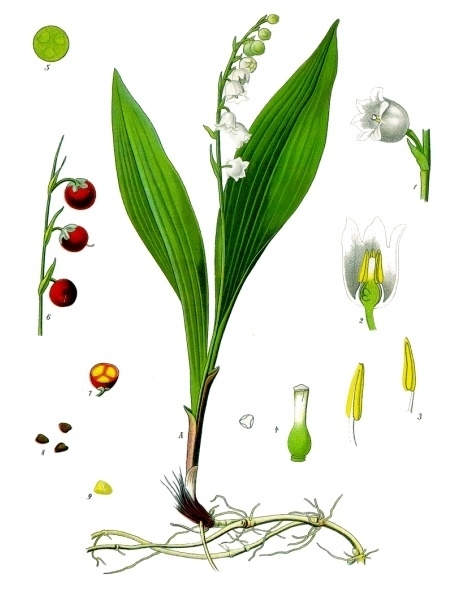 At the back of the leaves, lightly enclosed at the base in the same scaly sheath, is the flower-stalk, quite bare of leaves itself and bearing at its summit a number of buds, greenish when young, each on a very short stalk, which become of the purest white, and as they open turn downwards, the flowers hanging, like a pearl of fairy bells, each bell with the edges turned back with six small scallops. 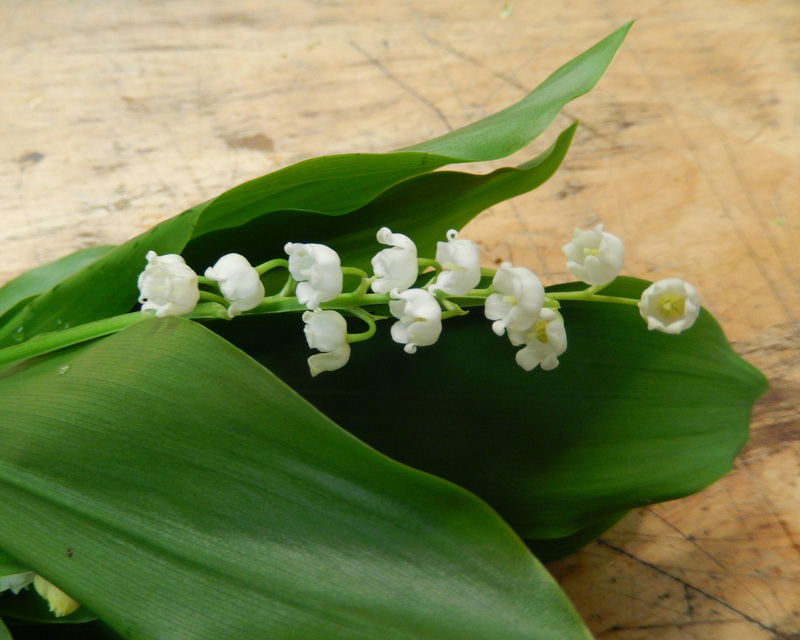 Lily of the valley has the flower meaning of humility, chastity, sweetness, purity and is said to bring luck in love. It also means “the return of happiness” which is the reason why it is often used as decorations in weddings. C. majalis is a herbaceous perennial plant that forms extensive colonies by spreading underground stems called rhizomes. New upright shoots are formed at the ends of stolons in summer, these upright dormant stems are often called pips These grow in the spring into new leafy shoots that still remain connected to the other shoots under ground, often forming extensive colonies. The stems grow to 15–30 cm tall, with one or two leaves 10–25 cm long, flowering stems have two leaves and a raceme of 5–15 flowers on the stem apex.